Sean Downey is one of five Irish riders in the An Post-Chainreaction set-up now, and heading into his third year with the squad in 2014, will be looking to bag some strong results. Although it has been registered in Belgium for several seasons, the An Post Chainreaction Sean Kelly team will be one hundred percent Irish from 2014, with general manager Kurt Bogaerts confirming on Saturday that the team is making a key change. “The team will be Irish next year – we go to registering there,” he told stickybottle. The squad made the change from an Irish registered team prior to the 2010 season, with Bogaerts explaining then that it gave it more access to Belgian events. It was particularly relevant for non-UCI races, which were important for the young riders on the team who were looking for a certain standard of competition as they gained strength and experience. Now, coming up to four years later, he feels that things have changed and, on the balance of all the factors, being Irish brings additional benefits. “The UCI state that the majority of your riders need to be from the country you register. 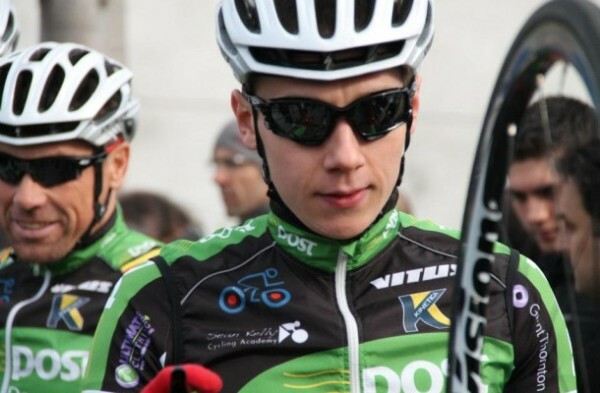 I have five Irish riders at the moment for 2014 – Sean Downey, Ryan Mullen, Conor Dunne, Jack Wilson and Marcus Christie. The next highest nationality is only three,” he explained. He said it will affect the race programme, but overall the selection of possible events should be better. “The main negative point is that we will not be able to ride the small kermesse races in Belgium. We cannot change that. But we will get a lot of invites of 2.2 level. “For example, next year we will ride the Tour of Normandy. We have also got an invite to the 2.1 Tour of Azerbaijan, probably because we will be Irish. “While we will miss the Tour of Belgium too, it always clashed with the An Post Rás and meant that we couldn’t have full choice with the selection of riders for that race. “It seems clear to us that there will be more invites this way. The problem in Belgium there are so many Continental teams. At the end of the day, the organisers will say that we have fifteen Belgium teams – Pro Tour, Pro Continental and Continental. Those organisers also want a more international field. Bogaerts also confirmed that the former Belgian champion Niko Eeckhout has taken up a management role with the team. The 42 year old competed with the squad until this year but then retired. He will now act as a coach to riders who need one, will oversee the programmes of those who already have one, and will help co-ordinate races. In addition to that, he will work on invites to races and interaction with current and potential sponsors; important considerations as the team hopes to turn Pro Continental in 2015. The team is currently on a training camp in Calpe, Spain. It started on Tuesday and runs until the same day next week. The riders are logging kilometres of pre-season work and also planning for what Bogaerts, Kelly and Eeckhout hope will be a very successful year.